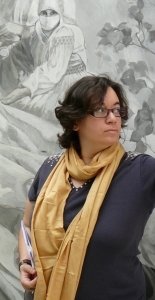 Samira Negrouche is a French speaking Algerian poet and author, living in Algiers. She is the author of several poetry collections, short essays and prose writings. Negrouche also translates poetry from Arabic and English into French. Her works are translated in more than fifteen languages among those English by Zoë Skoulding with whom she collaborated in 2014 for a 179° performance in the Ledbury poetry festival and the mosaic Rooms. She has worked on interdisciplinary projects with music, theatre, video, photography as well as plastic arts. Some of her publication: Cabinet Secret (2007), Le Jazz des oliviers (2010), Seuil dynamique (2015). Trained as a medical doctor, Negrouche dedicates her full time to creative projects.